naomese - naomi bardoff's art blog: what AM I doing now? Now that I've finished my tablecloth, I'm feeling the lack of structure in how I work. The week I was worked on the tablecloth, I knew what I was doing each day, and stayed in my studio and the art building longer. My work is all over the place now. I've been working on some stencils for my walls and finding things to do with my leftover fabric paint. 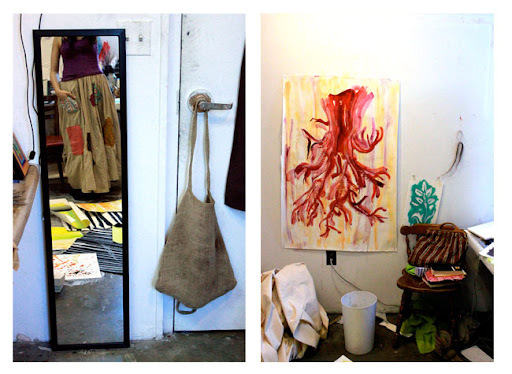 I started a big acrylic piece on paper (right) and I've spent a lot of time walking around the art building in my patchwork working skirt (left). 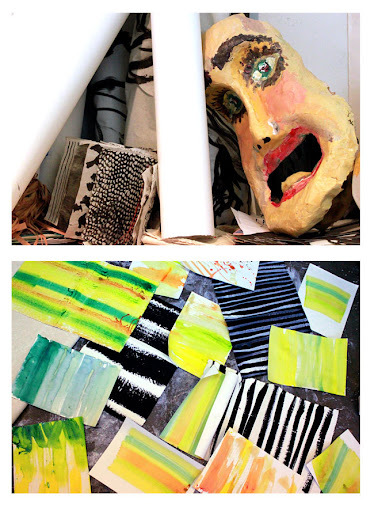 I've also been having craft meetings in my studio, making things like the big mask above for the circus this may. I'm trying to make my project for this week to make a lot of canvas throw rugs for my show. 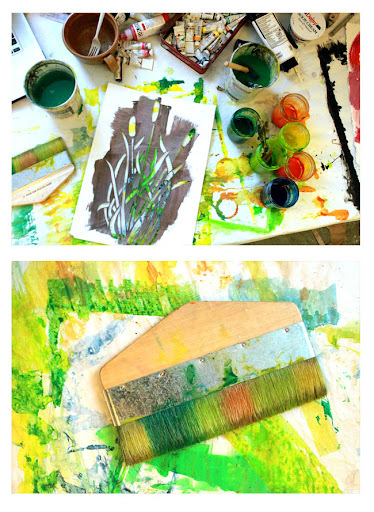 That's what the black and white rectangles are, the colorful pieces are experiments using fabric paint on paper. Love the plant with the leaves (spelling) created in outline, not directly. You are the greatest! Can't wait to see your senior project. Naomi, I finally outsmarted the crafty Fox this morning and posted her on my blog !! !